But now we seem to be inching toward spring. Our snow mountains are shrinking and we can actually see [wet, muddy] grass showing up in random patches. Iâ€™ve even gone outside in short sleeves to get the mail and havenâ€™t turned into a Katie-cicle! Iâ€™m ready for flowers, bike rides, and chalk drawings in outfits that donâ€™t include heavy coats and frozen fingers. Itâ€™s important when setting goals to not make vague statements, but rather something measurable. A few of my goals below might sound vague, but in my daily life I have more specific guidelines so I can check my progress and stay on track. Setting SMART goals are really helpful if you want to be able to track your progress and make sure you are heading in the right direction. I love this post from Cari Jehlik about SMART goals. It breaks the letters down and includes great examples for goals that hit all the requirements. If you need some other ideas for setting or reaching goals this year take a peek at this post with resources and ideas for goal setting and achieving. Iâ€™m sharing my goals, not to make you think you need to set your own or do these same things, but for inspiration and encouragement. We are all works in progress that need to keep running our own races. Depending on your season of life you might need to make a goal of â€œtake a 20 minute nap each dayâ€� or â€œplan meals and order groceries every Thursday.â€� Whatever will help you grow, manage your home, and embrace this life are what you should be focused on. Read my January goals update here. Make healthy choices daily. This includes drinking enough water, being physically active, spending 10-15 minutes relaxing, and saying no to extra treats when I know Iâ€™m not actually hungry. Iâ€™ve been doing great at getting in my water each day. I have a gallon jug that I fill each morning and work to finish over the course of the day. Iâ€™ve only missed a couple times this month and thatâ€™s usually on days we are busy running and Iâ€™m not as focused on the task. This month was a bit of a challenge due to all the snow days and school off days. I did try to shovel whenever needed and itâ€™s a great workout but I think most weeks I got in 3 workouts. Micah and I are trying to reach for apples, carrot sticks, and other healthier options at night. Some nights we do great, others not so much. Read my Bible and spend time in prayer each day. I often skip weekends because my morning routine is different but thereâ€™s no reason I canâ€™t stop for a few minutes for Jesus. I did much better in March with this! Instead of starting my weekends with the news, Facebook, or Instagram Iâ€™m switching right to my Bible app to read my chapter of Proverbs. Have one â€œno deviceâ€� night each week with Micah. We started this recently and itâ€™s really nice, although challenging! We usually watch a movie and we catch ourselves wanting to grab our phones to look up actors names on IMDB. Instead we are fully present and together - what date night should be! We didnâ€™t do quite as well with this in March but not for any specific reason other than habits. We get the kids down and collapse on the couch together on the weekends. We didnâ€™t completely fail, but there was at least one week, possible two, where we missed a no device night. We will do better in April! We were also able to get out for a day-date thanks to a friend taking the kids while we went to see Captain Marvel. Go on 3 individual dates with each kid. Because we have five kids we each take turns over the course of two months going on parent-kid dates. I will have dates in January/February, May/June, and September/October. Micah went on his dates with Cade and Parker in March. Next up is Jamison and he is still trying to decide where exactly he wants to go. Try one new recipe each month. Iâ€™ll probably try more than this but this will force me to be intentional. Iâ€™ve started a list of what I want to do and some recipes are items that I would usually buy - like homemade yogurt and cream cheese! After over a year of owning my Instant Pot I finally got brave and tried making my own yogurt! After I got all set up I realized our digital thermometer broke about a month or two ago and we had yet to replace it. The process was really easy and it did set up, but I didnâ€™t have cheesecloth to strain it really well. I strained it using a flour sack towel but it was still fairly runny. Do a mini-declutter each month. In 2017 I did a weekly decluttering challenge that lasted the full year. It helped our home greatly but there are always new items coming in (hello, family of seven!) so there are always items that can go out. Our bedroom was turning into a holding ground for items that we wanted to sell or donate, or simply werenâ€™t sure what to do with anymore. The small couch in our room was buried under a variety of things so I sorted through it all, found several things to donate, and lots to simply trash. Check out the before and after photos! Now the key is always maintaining this level of cleared-off-ness. I feel like that should be a real word. The stuffed animals have rips that I need to sew back up and the box is filled with cloth diapers Iâ€™m trying to sell. I need to find places to hang my paintings so they arenâ€™t just hanging out on the back of the couch, but otherwise Iâ€™m pretty happy with the progress. And it only took about 15-20 minutes! How are your goals going this year? What are you doing to track your progress? Iâ€™d love to cheer you on! 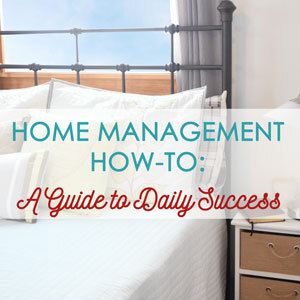 Iâ€™m Katie and Iâ€™m here to offer practical and realistic homemaking tips that you can start using today to help manage the chaos in your home. In between, Iâ€™m here for encouragement so you can learn to embrace and love your real life.